A new U.S. Food and Drug Administration study has found that farmed shrimp can be added to the list of animal protein sold in grocery stores that harbors multi-drug resistant bacteria. That list, now being joined by farmed shrimp, includes pork, chicken, ground turkey, and ground beef. The article was published in the peer-reviewed International Journal of Food Microbiology in February 2012, and while it has not been covered by the mainstream media, given the importance of the study findings I think this article deserves more attention. The authors collected 330 shrimp samples from six grocery stores in Little Rock, Arkansas. In each sample, the researchers looked for bacteria called Klebsiella, which can cause a wide range of human diseases from urinary tract infections and soft tissue infections to pneumonia. Although Klebsiella are fairly common in the environment, the bacteria pulled from these shrimp were far from normal. Forty percent of the Klebsiella the authors tested were resistant to five or more antibiotics: penicillin, ampicillin, rifampicin, streptomycin, tetracycline, and bacitracin among others. The significance for consumers is that multi-drug resistant Klebsiella infections from shrimp would be difficult for doctors to treat with antibiotics. A second concern is that during preparation in the kitchen, raw shrimp could cross-contaminate other foods or cooking surfaces, further spreading the bacteria. How common are antibiotics in shrimp farming? Less than a year ago, I published a paper with others at the Center for a Livable Future showing that imported shrimp are the most common seafood product to contain antibiotic residues, and that testing of imported seafood in the U.S. is inadequate. The shrimp in this study were imported from Thailand, a country with a history of using antibiotics to control shrimp diseases and increase production. In our study, Thailand was among the top violators of antibiotic residue tolerances, along with Vietnam and China. Previous reports confirm frequent use of antibiotics; a decade-old study of Thai shrimp farmers found that nearly 75 percent of them use antibiotics on shrimp, most prophylactically and some use antibiotics every day. I am not sure what the antibiotics use rate is today, but based on the results of the current study, I suspect that antibiotics are continuing to be used in shrimp farms in Thailand. Now that FDA scientists have uncovered a potential health hazard from grocery store shrimp, an obvious next step is to learn more about the extent of the problem by including shrimp in FDA’s nationwide survey of retail meats, called National Antimicrobial Resistance Monitoring System (NARMS). “Isolation and characterization of multidrug-resistant Klebsiella spp. 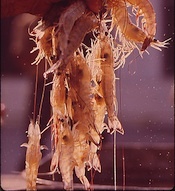 isolated from shrimp imported from Thailand” was published online in Feb 2012 (epub) and in print in April 2012.